Asian market find. 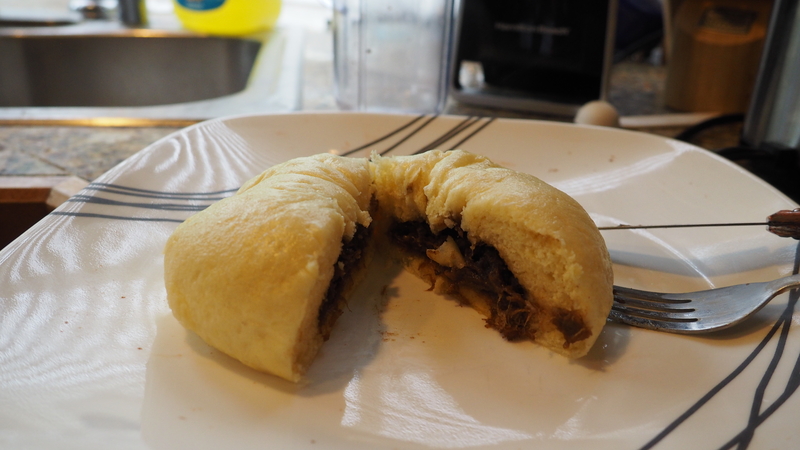 Golden Coin Beef Teriyaki Manapua. I stuck it in my steamer for 15 minutes but you can also cook them in the microwave. Came out awesome and they have decent macros. A little home made dim sum. Macros for this flavor are 19c/4f/12p. I also picked up some other flavors yesterday and will post them as I eat them. The other flavors have a little more carbs but most have about 4g of fat which isn’t bad. Went to Mongolian BBQ last night for dinner with the family and brought my scale with me to weight out every veggie and piece of meat to stay on my macros. Decided to make my own version at home. 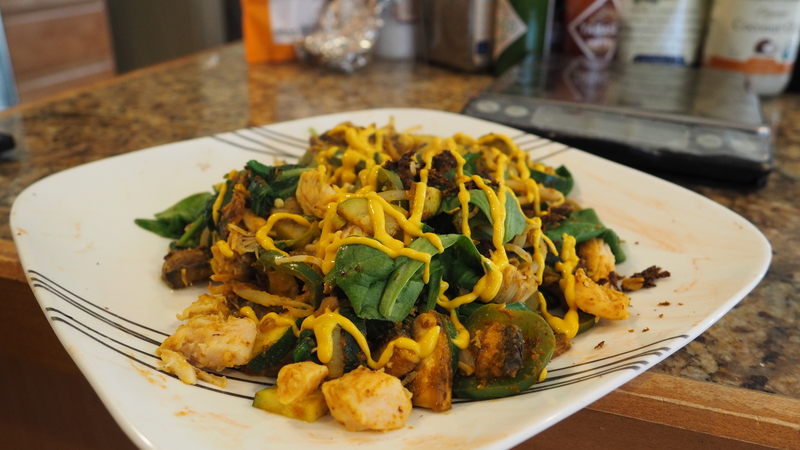 100g mushrooms, 113g zucchini, 85g bean sprouts, 40g chopped onions, 1 jalepeno, 85g spinach, 112g chicken breast. Added some random seasoning including curry powder, ginger, garlic, cumin, smoked paprika, and onion powder. Topped it with a little mustard. Filling and tasty. Are you tired of having to go to the grocery store every couple days just to buy egg white? I know I am. I used to walk in and buy 5-6 cartons of the bigger cartons of egg whites then like three days later I would end up right back in the same section buying more! Then it seemed like everyone is on the egg white bandwagon so it was getting tough to find them and get them when I needed them. Looking online for a place to buy egg whites turned up a lot of places trying to sell you on powdered egg whites but I wanted to real thing. One of the companies that kept coming up was MuscleEgg but they were a lot more expensive than just buying at the grocery store even if it was more convenient. I did some more digging and found Lana’s Egg Whites. 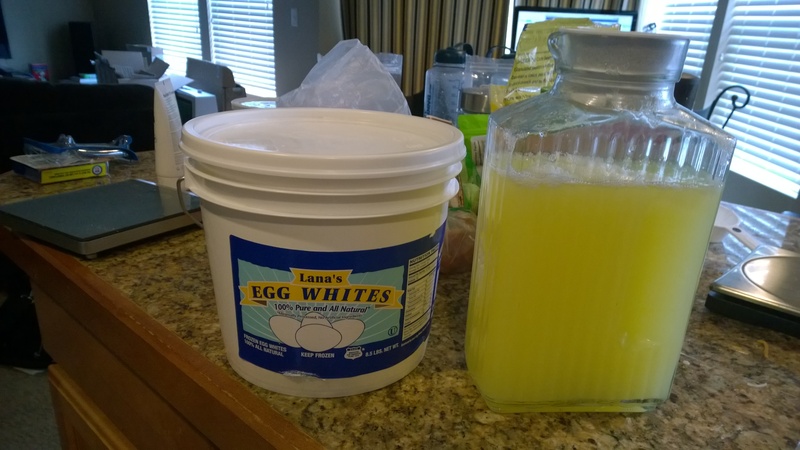 They are all natural egg whites that come in an 8lb tub and are delivered quick and frozen. I placed an order for two tubs that were $49.99 which for as much egg whites as you get it is definitely worth it. I placed the order online using PayPal but they also take credit card and received them in a couple days. While I was waiting for the tub to arrive I contacted them to get a couple of questions answered so that I could convert my recipes. They use cups instead of grams on their site but when you get the tub they tell you 1/2cup is 122g. I also had a question on how they recommend getting them out of the paint can like jug they came in. With in a couple hours I had a response to my mail and received the answers that I was looking for. They told me that they recommend putting them in like a kool-aid contain which would be great but I had trouble finding these so I improvised. I picked up a closable carafe from Target but to start I was to short to reach the bucket to the funnel in the top without spilling it all over the place. To solve this issue I grabbed a water bottle, squeezed the air out of it, turned it upside down and shoved the nozzle in the egg whites. It sucked them right up and bam! I had my egg whites. So that kind of describes the how to get them and get them ready to be used. Now the important part. Since they are food it clearly is all about taste! They are great! They taste fresh and cook up just like regular egg whites. Best part is they are natural so they have no gums or anything in them like the ones you get at the grocery store. I have used them in making omelets, waffles and they came out better than before. I actually prefer the taste of these over that of anything that I have bought at the store. I’m not sure what I am happier about not having to buy egg whites at the store or how they taste. The one hiccup of the process was I ordered two and only one arrived the first day. I contacted Lana and like before got an immediate response! They checked and the next day the other one arrived so something went a little sideways on the shippers, UPS, side. The best part was they were on top of it and kept in contact with me to make sure that I am happy. As someone who has worked in customer service and IT I value the importance of customer service over almost anything when I am looking at where to buy things. Lana’s has built a life long customer based on their customer service. The fact that Lana herself responded to mail shows how much they care about the customer. Need another reason to check them out? Have you heard of Phil Heath? Yeah he’s a user of their product! Check out http://lanaseggwhites.com/ you will not be disappointed! Give them a try and let me know what you think! I could say so much more positive about them but I feel like I am rambling now! That’s a lot of egg whites. Worth every penny! What if you just say “I love really thin pancakes”. Hey guys and gals for breakfast today I switched it up a bit. 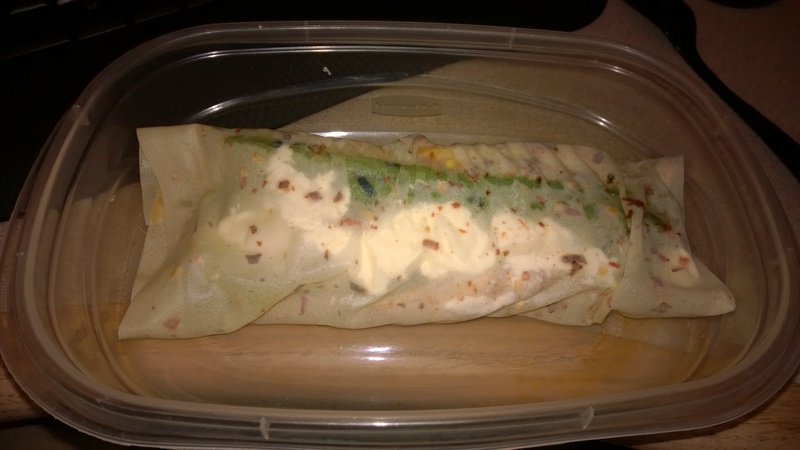 I picked up some Michel De France crepes the last time that I was at World Market and decided to give them a try today and let me say they did not disappoint! They are very macro friendly at 9c/1f/1p for each crepe! I ended up having 4 today for breakfast which I was plenty filling even on my poverty macros, but I did hit under 170 for the first time since high school! Look out for my about me post coming TODAY and I will post some transformation photos. So for the crepes I decided to do two eggs and bacon and two filled with a Greek yogurt filling. These crepes were actually great tasting by themselves with a nice sweetness. For the egg and bacon ones I used half a cup of egg whites in each and then a single slice of Trader Joe’s turkey bacon in each. The combination of the sweetness of the crepe with the savoryness (might not be a word but it is now) of the bacon made these taste amazing! They were almost like a McGriddle. Maybe the next time I might also add a little cheese to them for some more flavors but really it doesn’t need it. 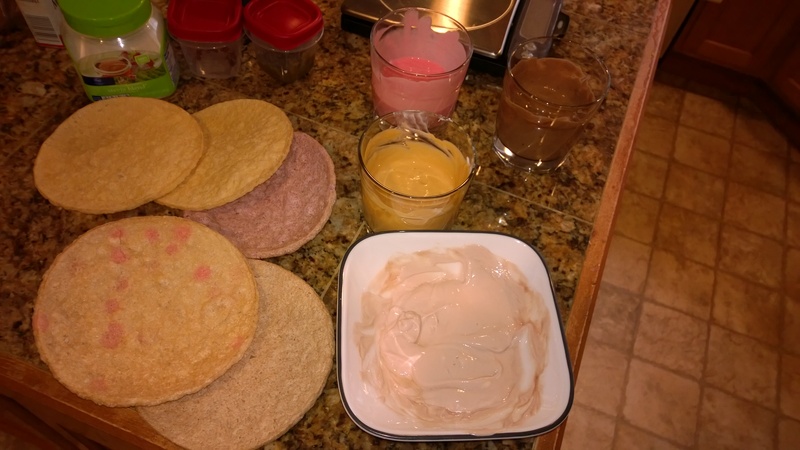 The macros for each of these crepes were 10c/2.5f/20p. Highly recommend these! For the sweet crepes I made a filling of 1cup 2%Fage Greek yogurt, 17g of natural peanut butter, 17g of raspberry preserves, and 22g of whipped cream cheese. I thought this mixture might need some Splenda to cut the sourness of the Greek yogurt but the peanut butter and the preserves cut it perfectly! I also thought about putting some syrup on these but after eating the egg and bacon crepes and finding out that they are sweet and the filling for these was good enough that I didn’t need the syrup. Each of these crepes were 17c/10f/15p. The fat on these can be cut by using the fat free Greek yogurt. The best part about this whole meal is that the longest part was just cooking the eggs and bacon. I microwaved the crepes for 30 seconds once I had them filled. If you can find these crepes give them a try! If not they can be ordered online at http://www.micheldefrance.com/ where you can get a case of them for $21.00. These would also be great with some fresh fruit and other fillings once I start getting a little more carbs in my diet. Hope you guys enjoy! Let me know some of your favorite fillings for crepes. The one on the end stuck to the plate a bit but it didn’t taste any less amazing! Look at all that sweet goodness! Pi Day? Should be Tri Day! Actually today was chest and back but I hit tri’s with chest so counting it! How’s it going guys? Today was a pretty standard meal day up until dinner and dessert when I stepped out of the box a bit. For dinner I changed the pizza game up a bit with this new Mountain Bread wraps that I found. I decided that I would try some pastries with the toppings that I was going to do a pizza with. What did I discover? So as I work on my wrapping of these I am going to hold off on making a video about making them for now but I promise I will keep trying. 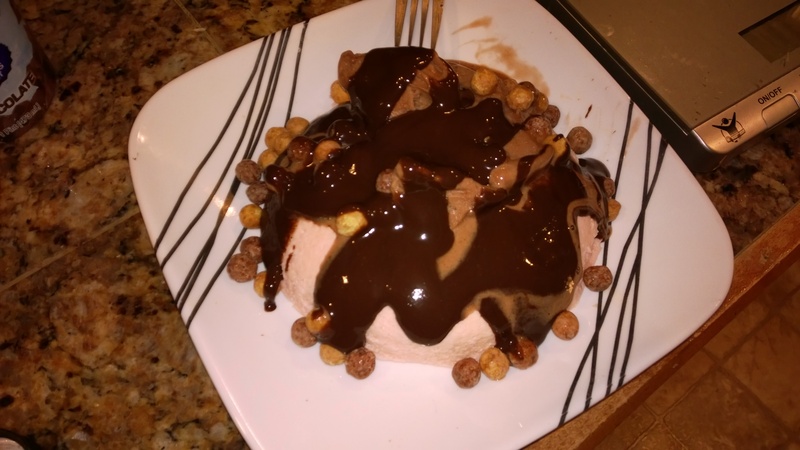 The macros for the dish wasn’t bad at all and ended up leaving me extra room for more fun stuff for dessert. The macros are 21c/12f/34p. The fats can be reduced by using egg whites, fat free cheese and a leaner meat. I plan on trying this with some other fillings as well maybe even go a little Asian or Mexican with it to get some different flavor profiles. Let me know what you guys think and what your thoughts on some fillings could be. Thinking also of rolling some up and making some fluff and piping it inside as a “pronoli” or protein cannoli! In all I have big plans for the Mountain Bread. End this rant! Mountain Bread Oat filled with pork, cheese, and mushrooms, a side one egg omelet, and some marinara for dipping. Inside puffs. These were great! Only using one of the wraps gave me an additional 14 carbs to play with for dessert and I had some options that included crumbles of chocolate chip cookies which might be in the cards for tomorrow, Hershey’s cookies and cream cereal, Fiber One Cereal for that extra fiber, fruit, or what I ended up going with was Reese’s puffs! I have been afraid to go to some of the sugary cereals because I tend to start to crave them but I figure the way that my weight has been going I can keep strong and that is what I am doing! I hit 171.8 yesterday which is again a new low! So I used my standard cake recipe, topped it with some Chocolate syrup and Chocolate Arctic Zero then topped that with the Reese’s puffs. I was in heaven! Macros are 24c/10f/36p. Strawberry protein cake with chocolate Arctic Zero, Walden’s Frams chocolate, and Reese’s puffs. Maybe instead of tri day I’ll call it try day because of the different foods I tried today. The weekend is tomorrow and I plan on posting up 3-4 videos including the tuna casserole and a pizza recipe. Watch for some crazy stuff coming up! Thanks guys and gals for checking this out and don’t forget to subscribe to the YouTube channel for some great upcoming content. Hit me up on twitter, Facebook and instagram @cookingtofit. Have a great weekend! Today for dinner I decided to give the Mountain bread that I found at Whole Foods a try. I used the rice version for this one and filled it with 60g of pork, 25g of mushrooms, 42g of spinach, 42g of broccoli, 1 slice of swiss, and 31g of pizza sauce. The top crisped up really nice but could have given it some more time so that the insides were a little hotter and the bottom and sides were a little more crisp. In all it was great tasting and I would definitely buy and use it again. Its got great macros too. the whole meal was 33c/10f/33p and the bread was 26c/1f/5p for two sheets. I can see this being used for a lot of different pastries, using a single sheet for a pie crust, or trying to make some dumplings. Going to start coming up with some ideas. Hopefully this is a product you can find and try out. Another product that I wanted to talk about was MyOatmeal. This is custom flavored oatmeal that you can make some great flavor combination. I have two flavors, Key Lime, White Chocolate, and Graham Cracker Crust and Pumpkin Spice, White Chocolate, Graham Cracker Crust. I used steel cut oats for each combination and I have been soaking the oats overnight with some unsweetened vanilla almond milk and it comes out great! Today I had the key lime and it kept me full through my workout. They also do flavored powdered peanut butter! I highly recommend checking out http://myoatmeal.com! The ingredient for my dinner pastry. The pastry just out of the oven.